Chocolate has fascinated and seduced us for over 5,000 years. At once nostalgic, a balm for heartache, and a symbol of desire, it is revered in literature, is a cornerstone of family celebrations, and has played a unique role in the stories of women and slavery. In Cocoa, Sue Quinn delves into the history and culture of chocolate, from the spiced drinks sipped by the elite in ancient Mesoamerica to the artisan bars spiked with intriguing flavours we devour today. Through 80 tantalizing sweet and savoury recipes, she inspires us to enjoy chocolate in both new and traditional ways and to celebrate its exotic power over us. Published by Quadrille in March 2019: to order click here. One roasting tray, one complete meal no fuss, and minimal washing up! Move over one-pot: one-tray is the quickest, easiest way to make fast, tasty meals in the oven. You can make entire family suppers just in a roasting tin or an oven tray everything from breakfasts like baked apple porridge or Shakshuka, to handy snacks, lunches and warm salads including quick flatbreads and frittatas, through to warming gratins, risottos and roasts, and of course, delectable cakes and traybake puddings like peanut butter and caramel brownies. Sue Quinn is a wizard at simple, economical family cooking and her recipes cover every meal of the day all in one tray. With straightforward instructions and no-nonsense tips for getting the most flavour out of your cooking, not only will you have everyday meal solutions but less hassle and mess in the kitchen. Doctors and scientists around the world hail the Mediterranean diet as the healthiest possible way to eat, linking it to lower risk of heart disease, stroke, diabetes and other illnesses. Easy Mediterranean celebrates this nutritious – and, most importantly, delicious – approach to food. 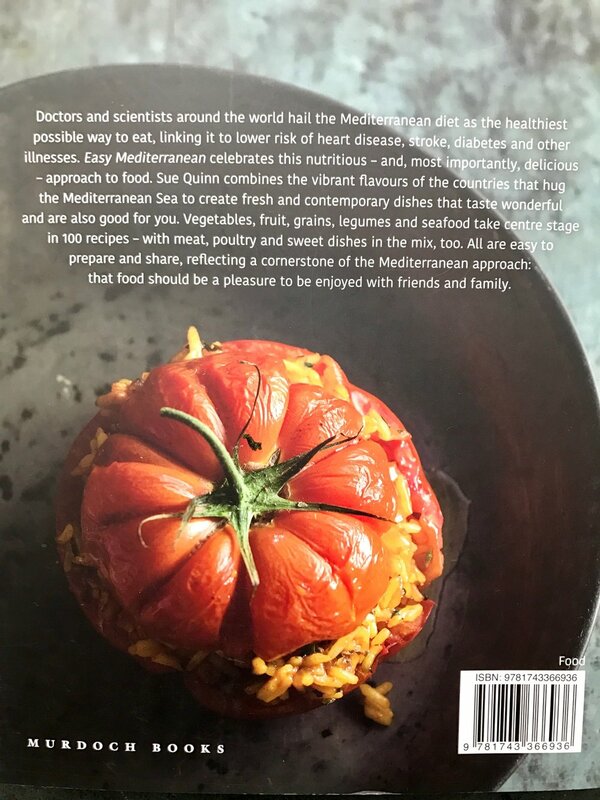 Sue Quinn combines the vibrant flavours of the countries that hug the Mediterranean Sea to create fresh and contemporary dishes that taste wonderful and are also good for you. Vegetables, fruit, grains, legumes and seafood take centre stage in 100 recipes – with meat, poultry and sweet dishes in the mix, too. All are easy to prepare and share, reflecting a cornerstone of the Mediterranean approach:that food should be a pleasure to be enjoyed with friends and family. Veganism is a growing trend worldwide but many of the books currently on the market are health focused rather than recipe and taste focused. They can also look rather forbidding and serious. Easy Vegan offers 160 delicious recipes without animal products for wannabe vegans, existing vegans or those wishing to learn more. It targets those who want to eat less animal product for ethical and health reasons and also those who might just want to experiment with this style of cooking or who have family or friends who are vegan. These recipes are proof that vegan food can be tasty and interesting. Easy Vegan includes great explanations on how to replace the animal- sourced elements of recipes: how to 'veganise' a recipe, how to make vegan butter, how to replace eggs in a recipe, and uses illustration to break down some of the facts surrounding vegan food into visuals, so key information is easy (and fun) to assimilate. The Kids Only Cookbook is packed with 50 simple, delicious and fun recipes containing easy-to-follow captions and 300 photos in a unique cartoon-style to inspire children of all ages to get busy in the kitchen. Original and creative projects will capture kids' imaginations: such as the paper bag breakfast of a bacon and egg sandwich in a paper bag cooked on a barbecue. The kick'n'roll tin can ice cream is bound to be the project of the summer: pack a large tin can with ice and rock salt, insert a sealed ziplock bag containing cream, sugar and vanilla and kick it to the park or the beach...within 25 minutes...homemade ice cream! Kids will also learn as they go along; each recipe contains a culinary technique such as beating, whipping, piping or baking and 'Adult alerts' appear throughout the book and ensure the recipes are all easy and safe to make. This is a book which will become treasured as it helps children to discover the endless fun to be had in the kitchen and to learn skills which will stay with them for life.The Kids Only Cookbook is packed with 50 simple, delicious and fun recipes containing easy-to-follow captions and 300 photos in a unique cartoon-style to inspire children of all ages to get busy in the kitchen. Over eighty quick, easy, and delicious recipes perfect for light, fresh lunches as well as hearty dinners. Proving that salads aren t just for health kicks, these recipes are inventive, bold, and often satisfying meals in themselves. Sue Quinn presents an explosion of textures, flavors, and colors and shows that an artfully prepared salad is one of the most delicious dishes you can eat.Covering three main types of salads grains and pulses; meat, fish, and cheese, and vegetable-based something to suit every taste and mood. From the quinoa with pesto and feta salad to the falafel-and-salad combo, there are some super-hearty salads sure to satisfy the biggest of appetites. Featuring classics like the chicken Waldorf; creative ideas like chorizo, peppers, and chickpea. And a section on dressings to take these dishes to new heights, "Salads" offers minimum preparation and maximum flavor for those who love nutritious, wholesome food." While many cookbooks and cooking shows would have us think that cooking dinner involves long lists of ingredients and several hours of commitment in the kitchen, Sue Quinn proves that it really doesn't have to be that way. Here's how to prepare wonderful food quickly and easily with a handful of well-chosen ingredients. Tip One: Keep your pantry stocked with fresh pasta, jars of marinated vegetables, frozen fruit, punchy sauces, cans of passatta and excellent stock cubes or bouillon powders - all great short-cut ingredients that mean you can cook speedily without compromising on flavour. Tip Two: assemble all your ingredients and cooking utensils before you start cooking. There are 160 recipes all up, from plates to share and light bites, salads and soups, to pasta dishes, meat, poultry and seafood dishes and desserts. This handy book is an excellent entry point into reducing (or even eliminating) added sugar in your diet - something we all know we should do. But you won’t miss sugar! Here are 65 delicious and innovative recipes for breakfast snacks pastries and desserts that allow you start the day with a peanut-butter and chocolate milkshake snack on raspberry-almond focaccia choose scones for tea and eat chocolate ice cream - all sugar and guilt free. Sue Quinn also has solutions for basics such as ketchup apple sauce blueberry jam and bread. Added sugars should not exceed 10% of our daily calories and ideally less than 5%. Many so-called ‘sugar-free’ recipes are in fact stuffed with honey agave or other sugar syrups. While natural these syrups are in fact full of sugar have low nutritional value and sometimes contain a high level of fructose. None of these sugar substitutes are used in this book. Instead the recipes are sweetened with fresh and dry fruit. With stylish design and photography sugar-free food has never looked so enticing! A collection of more than 60 dishes that showcase super foods, from kale and seaweed to cocoa and avocado that are brimming with vitamins, minerals, and disease-fighting nutrients.